NEWTOWNCUNNINGHAM mammy Maria Rushe tells her children she's a mythical creature who "farts glitter". And she's also a successful blogger who's just been shortlisted in the country's top blog awards for her hilarious take on motherhood. Maria, who pens the hugely-successful ‘Secrets of S-Mum’ blog, made it through the long-list of thousands onto the short-list before her blog was selected for two categories in last week's national finals in Dún Laoghaire. “I was just so delighted to have been nominated, and I never expected to get shortlisted, never mind to the final," said teacher Maria who lives with fitness instructor husband Emmet and their two children in Newtowncunningham. 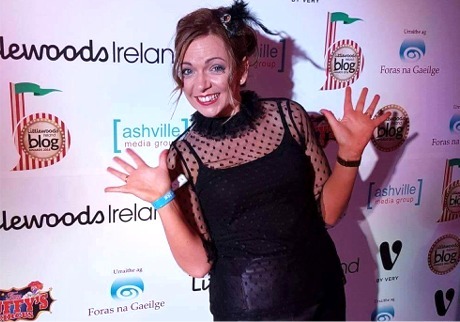 Donegal teacher and blogger Maria Rushe enjoys the Ireland Blog Awards 2016 in Dún Laoghaire. "I blog for fun and never anticipated being included in such a huge national awards process. “It was amazing just to be there on the night and to see my wee blog up there beside established and well known bloggers," added Maria who teaches English at Colaiste Ailigh, Letterkenny. "Well it wasn’t me. Anyway, you know Mammy only farts glitter..."